I was recently sent an iconic 1 litre Kilner jar by thinkmoney and asked to create a foodie concoction for their Jam J-Art project. It was important to me that the jar was personalised, while still being practical and of course tie in with its contents! Using Pinterest as inspiration I saw lots of ideas for cookie & brownie layer mixes. 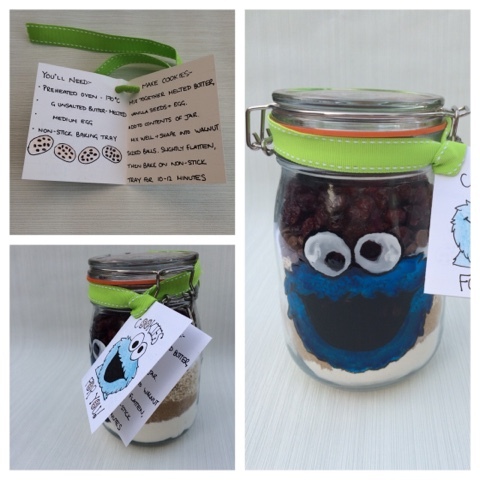 Knowing how many cookies we eat, that had to be the food element - and who better to theme my jar around than The Cookie Monster?! 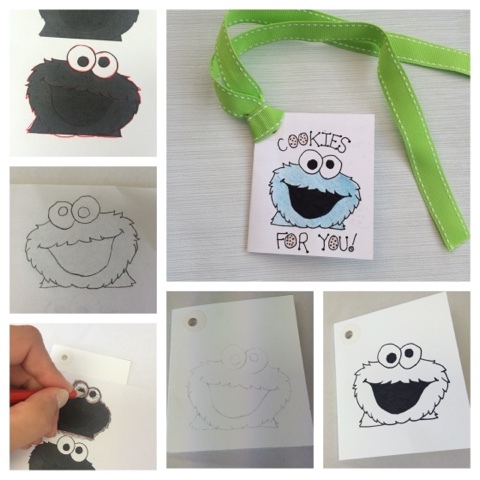 First I printed off a simple picture of Cookie monster in various sizes - one as a guide for decorating the jar and one for the label. 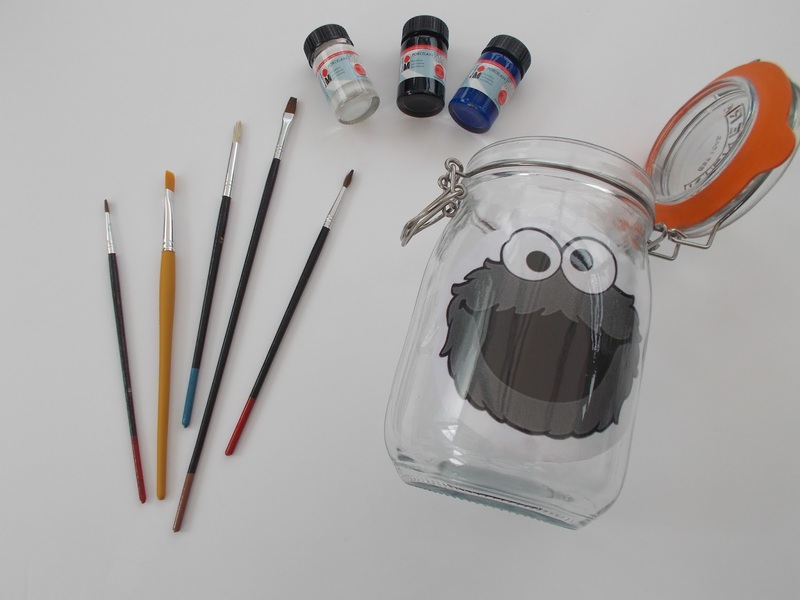 I secured the larger of the pictures inside the Kilner jar and used ceramic paints to paint directly onto the outside of the jar, making sure to leave a gap between each colour. Once the main colour blocks had dried (about 2 hours) I added outlines and touched up where necessary. To make the label I folded a piece of card in half, measured to be 8cm high & 7cm wide, reinforced with clear tape the top left corner and used a hole punch to allow ribbon to be strung through. I traced around the back of the smaller picture of Cookie Monster with a pencil, then traced over the top to transfer the pencil onto my label. This was coloured in and detail added. The inside was used to give additional ingredients details and cooking instructions. I also placed a whole vanilla pod onto the top layer to be used in the recipe. Additional ingredients required were 150g melted unsalted butter (cooled) &1 large egg (or 2 medium). Gently combine the butter & egg. take out the seeds of the vanilla pod & add to the egg mix. In a separate bowl empty the remaining dry contents, add the wet mix & combine well. Place walnut sized balls onto a non stick tray and flatten slightly. Cook in a preheated oven at 170C for 10-12 minutes. All that was left to do was to seal the jar and add the label. Once the cookies have been cooled they can of course be store in your cookie jar. The paint may be damaged if you immerse it fully in water, but you could use a spray varnish to seal it - or just gently wipe out the inside when necessary. These gift jars can be painted with any theme, for any event - Father's Day, teacher's thank you gift, house warming - endless possibilities! 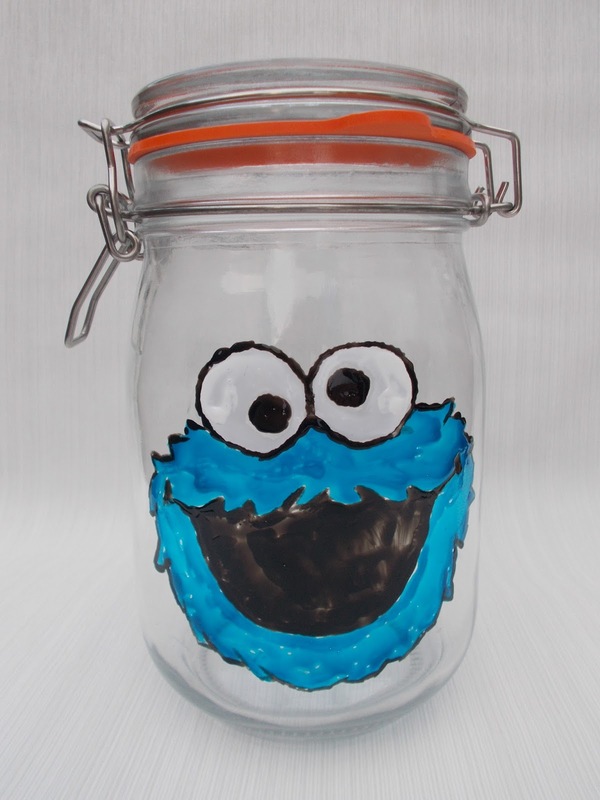 This cookie jar will be given to my niece & nephew for a summer holiday activity, I may (will) be making another one just for me! 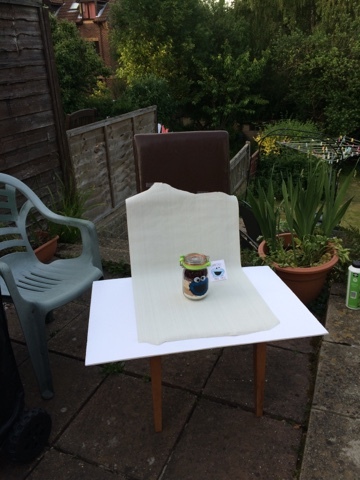 Just as a final funny the picture below shows you the reality of trying to fit blogging around a full time job - anyone else using their garden as a photography studio at 8.30pm?!! 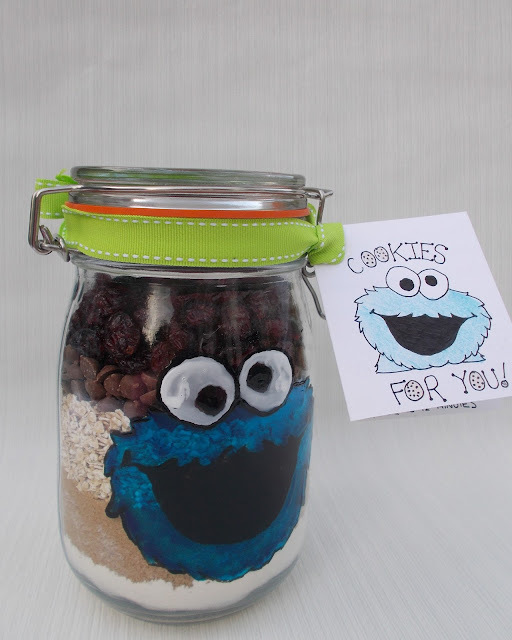 Who would you make a cookie jar for and what would the theme be? I was kindly sent a 1l Kilner jar to use in this challenge, all painting and colouring skills are my own!